The Pomeranian is thought to have gotten its name from a historical region near the Baltic Sea called Pomerania. The area of Pomerania is currently divided between Germany and Poland. Owners out to find a name from this region will have a side to choose. Those in favor of a German option will have names like Fritz, Katrin, Heidi, and Klause to pick from. A few Polish ideas include Casmir, Celina, Konrad, and Mirek. 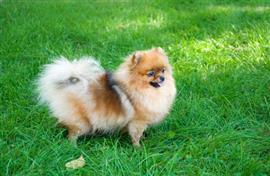 The Pomeranian is also known by the nickname pompom. A few fun names related to cheerleading include Pike, Liberty, Herkie, and Chant. A few names borrowed from stars that were once cheerleaders include Madonna, Halle (Halle Berry), Eva (Eva Longoria), and Teri (Teri Hatcher). A couple of Pomeranians were among the only three dogs that survived the Titanic in 1912. Astor, Carter, Harper, Julian, and Silvey are a few names in honor of passengers that were on the Titanic. Kate, Zane, Paxton, and Gloria are some choices borrowed from actors and actresses with a role in the movie ‘Titanic’. Some of our pages will contain a subcategory. A subcategory is a slightly more specific grouping than the main topic of the page. For a subcategory, we will include a separated table of names and corresponding descriptions. An example of a subcategory of Red Dog Names would be 'Dog Names Inspired by Red Wines'. If you have any subcategory ideas for the Pomeranian Names page, we would love to hear them. Use the form below to submit your ideas.